I came across a new program that claims it can help people make $5,000 in 24 hours or less and $100,000 in the next 30 days. I find this statement to be one of the boldest claims I’ve seen. If you have visited their landing page, then chances are their income claims may have caught your attention, but you want to know if this program is the real deal. 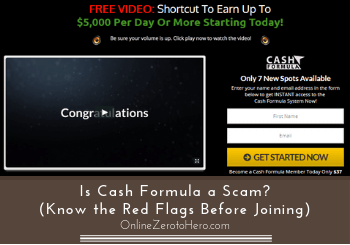 So, is Cash Formula a scam or a great opportunity you need to take advantage of this year? You’ll soon find out from this in-depth Cash Formula review, where I will share with you all the info I got about this program. I hope this review will help you make an informed decision because there are things you NEED to know before joining! Cash Formula is a new program that claims it can help people make $5,000 in 24 hours or less and $100,000 in the next 30 days. The alleged creator of this program is Michael Grant, and he claims that he discovered the world’s first and only done-for-you system called “free money system.” The most interesting statement he gives on their sales video is that he can guarantee your success. In my opinion, no one can guarantee success because it will all depend on the time and effort you invest in any online endeavor and Cash Formula is no different. There are NO shortcuts or automated system that can help you create a decent income online. That is why I don’t recommend this program because it has several red flags, that, in my opinion, makes it a risky investment. I would suggest that you look for other great opportunities online that can truly give you the results that you’re looking for. What is Cash Formula and what does it offer? When I first visited their sales page, I was a bit skeptical when I saw the incredible income claim on the header text that it’s easy to earn $5k per day using a done-for-you system. The most interesting statement he gave on their sales video is that he can guarantee your success. In my opinion, no one can guarantee success because it will all depend on the time and effort you invest in your endeavor, but I understand why he has the guts to say something like this. If you look closely on the main features of their program, they are highlighting that their system will employ an automated or done-for-you system, which means you don’t need to do anything once you set up their software. This might be the reason why they can supposedly guarantee your success, in my opinion. Also, you’ll need to shell out $37 to get into their program and have the opportunity to use their so-called secret system that can lead you to financial freedom. He will also tell you that he feels sorry for all the people who were scammed by various internet scam programs because he was also scammed before and he created this program to get back at those gurus. For me, this is a typical story I’ve seen before in other programs that I have reviewed in the past, and, in my opinion, these stories are meant to gain your trust and make you feel that Michael is on your side. Honestly, I can quickly point out some of the red flags on their sales page, and it’s NOT hard to find them since I have already reviewed a lot of these programs in the past. They usually use the same layout and way of promoting their product and Cash Formula is no different, because it has the same type of claims you can find in other similar programs. This is the main reason why I want to share with you some of the red flags I’ve uncovered from their site, and I hope this can help you in your decision-making process and make you aware of some important things to consider before investing any money. When I watched their sales video, it’s obvious that Michael wants to highlight several income claims and testimonials on their video. He makes it sound like you don’t need any technical skills or experience to be successful in their program. I also discovered that they would use the affiliate marketing business model in their program, which is a legit way of creating an income online. If you’re still new to affiliate marketing, it’s a way of making money on the Internet by promoting other people’s products and services through a blog site or social media. Once the people you redirected to the business owner’s site buy their product, you’ll get a commission in return for every sale you made. However, the issue I have with Cash Formula is not the business model they use. It is a great business model and a great way to make money online and can be done in an ethical way. Affiliate marketing is, in fact, one of my favorite ways to make money online myself. What I think the issue about Cash Formula is the lack of explanation of how their system works and your role within the system. Michael will tell you that their system will work flawlessly in your favor and that the cost is just $37, which is very little compared to the amount of money you will make through their program. But he is not interested in telling you the process of how their system generates that amount of money. In my own experience as an affiliate marketer, a program who is hesitant to provide you any details of their program is NOT transparent, and they do not want you to know the whole process for a reason. Just think about – what other kinds of product/service would you ever buy if you were not at least told what to do with it and without getting any information about how it works? Why would it be any different online? You need to get at least some kind of idea about what the product you are buying will offer you. That is why you need to take this red flag seriously before you decide to join this program. On their sales page, there’s a notice that there are only 7 new spots available, so they want you to hurry before someone else will take your spot. They are using fake scarcity tactics to lure people into their program. But if you refresh the page, the notice will always be the same and the 7 new spots left will always be there, so this means that they are using false scarcity tactics to engage people and hopefully convince them to buy their product without doing any research. In my opinion, using scarcity tactics is not a bad idea, because it has been used before by several online businesses to move prospects into action. But it’s not the same with Cash Formula since they are employing fake scarcity tactics, and it’s an unethical method, in my opinion, since they’re not truthful to their prospective clients. If they are not truthful about this and try to push you, what else will they not be truthful about? It’s clear that this is another significant red flag that you should think about before you make your decision. This program will cost you $37, but that’s just the initial fee because once you reach their membership page, you’ll soon find out that there will be upsells waiting for you there. As part of my research, I checked this program on ClickBank, and I found out that they have an affiliate’s page, so I also checked that out, and I’ve discovered that they are offering their affiliates a whopping $398.25 commission per sale. You can clearly see that they are offering their affiliates $398.25 commission per sale. This means that you can expect to spend more than $37 because Cash Formula upsells alone will cost you more than $400. I’m not questioning the quality of their upsells, as I have not bought them so cannot say anything about them for sure. But I will honestly never buy upsells from a program that has the kinds of red flags I am showing you in this review. And no matter the quality if the upsells, I think they should have been more transparent right from the start. But these upsells are NOT revealed in their sales page and video, which, in my opinion, is a bit upsetting since they have an obligation to show the consumers the real cost of their program. So you have to be aware that if you join, it can end up costing you a lot more than just $37 if you want access to everything they offer. Again, this is another red flag that you should consider before you purchase their program. Another red flag that I would like to point out on their sales video is the testimonials of their so-called successful customers. Based on my investigation, I found out that these testimonials are NOT from real customers, but most of them are paid freelancers from Fiverr.